Pre-ground electrodes are now being used commonly in Tube mills, orbital tube and pipe welding, plasma welding, and automatic/mechanized TIG welding. 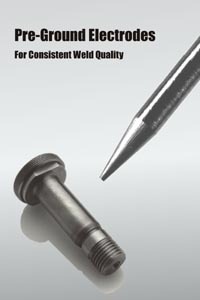 High quality electrode materials with exact tip geometry tolerances and repeatable ground surface finishes offer a noticeable difference at the arc to produce higher quality welds with significantly longer electrode life. Pro-Fusion offers these electrodes in a Standard 20 Ra finish or a Polished 6-8 Ra finish. All of the major tungsten materials are available with the option of specialty materials for specific applications. Call to request free electrode samples and a quotation. Copyright © 2003-2015 Pro-Fusion by Elderfield & Hall.